Is this a worthy successor to the original Desire? 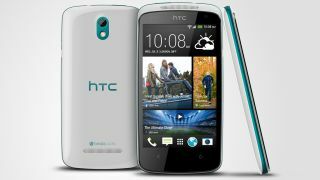 The HTC Desire 500 hits UK shores today, as The Carphone Warehouse has announced that it will be stocking the latest in HTC's Desire range. Coming in both the obligatory 'Lacquer' Black and 'Shimmer' White colours (exclusive to Carphone Warehouse), the HTC Desire 500 brings across many features that are found on the likes of the HTC One, at a more affordable price tag, with £180 on PAYG (plus top up) and £15 per month the lowest you can get it on a monthly deal. For your money, you get a quad-core Snapdragon 200 processor, clocked at 1.2GHz, as well as HTC's Sense 5.0 UI that packs in BlinkFeed. The most interesting element of the HTC Desire 500 is BlinkFeed, along with other Sense features, are now coming to the Desire range, where previously these were only found on the HTC One, One Mini and the One Max. In order to keep costs on the HTC Desire 500 low, other compromises include a lack of UltraPixel technology, but an 8MP camera has been popped on the back, with a 1.6MP snapper on the front. Beats Audio is also included, bringing improved sound with HTC BoomSound. We are currently putting the HTC Desire 500 through its paces, so stay tuned for our full HTC Desire 500 review.